(CNSNews.com) - Governments around the United States added a net of 14,000 jobs in March, according to the Bureau of Labor Statistics, bringing government employment in this country to 22,519,000 (from 22,505,000 in February). The last time government employed more people in the United States than it did this March was in July 2010, when total government employment nationwide was 22,569,000. 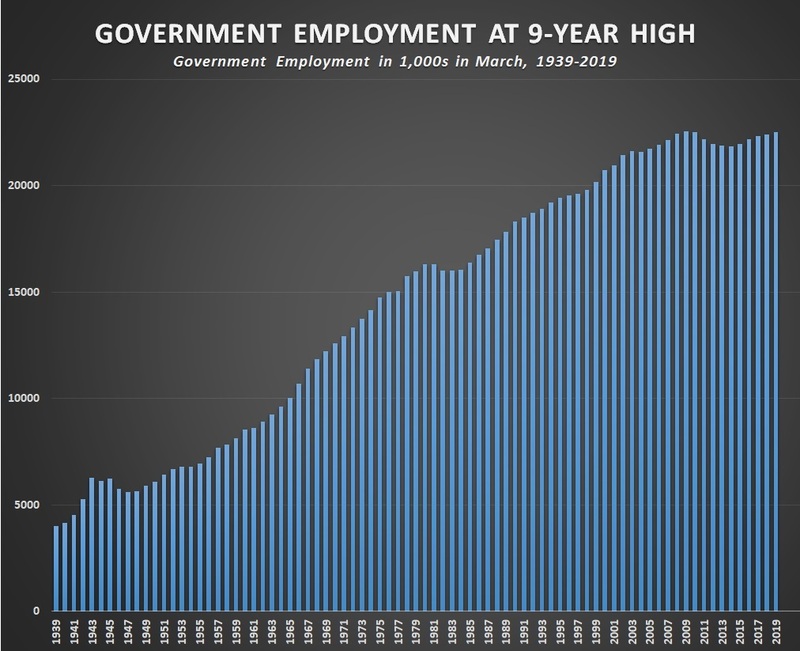 The all-time record for government employment in the United States was achieved in April 2009, when federal, state and local government agencies employed a total of 22,677,000. The current total government payroll of 22,519,000 employees is 158,000 below that all time record. Local government was the driving force behind the increase in total government employment last month. In February, local governments in the United States employed 14,517,000 people. In March that climbed to 14,529,000—an increase of 12,000. State government employment rose from 5,190,000 in February to 5,94,000 in March—an increase of 4,000. Federal employment dropped from 2,798,000 in February to 2,796,000 in March, a decline of 2,000.